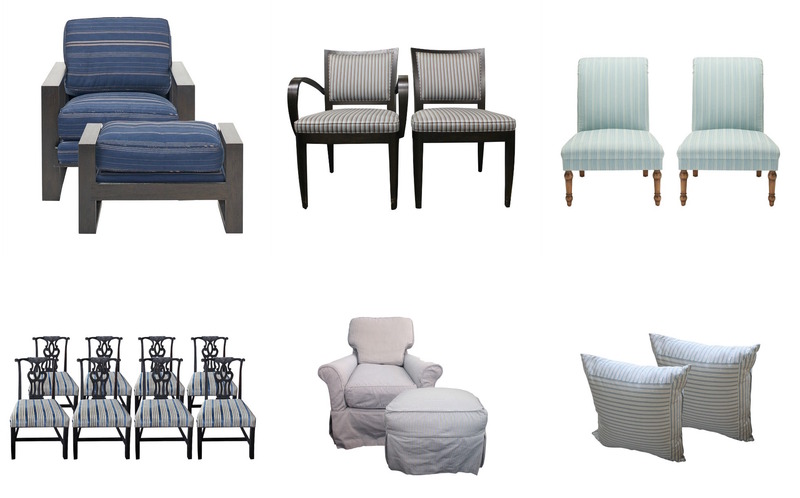 Are blue stripes a trend that we could be seeing more and more throughout the year? Â We certainly hope so, especially after seeing the gorgeous runway and interior designs from fashion designerÂ Ralph Lauren and interior designer Katie Ridder. Fashion Week is a time when designers present their vision for the upcoming season, as well asÂ the new trends everyone will be seeing (and wearing). 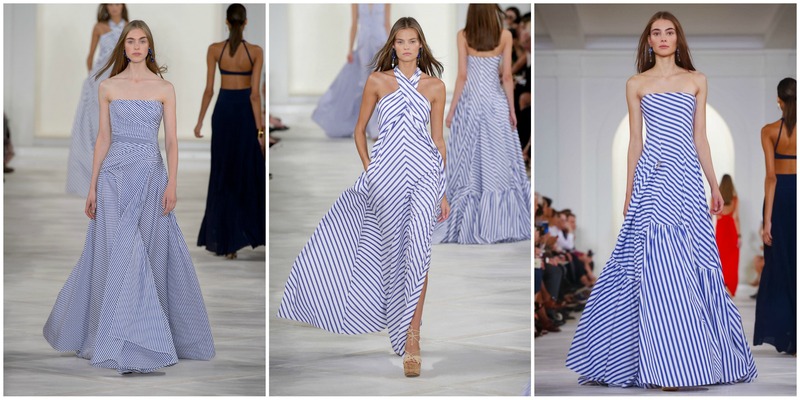 Ralph Lauren’s spring inspirations had models sashaying down the runway in beautiful blue-striped dresses. Not only does the pattern feel timeless; so does the unerringly chic combination of blue and white. Similarly, stripes were the star in this room, designed by interior designer Katie Ridder for her daughter’s room in the family’s Millbrook, New York home. 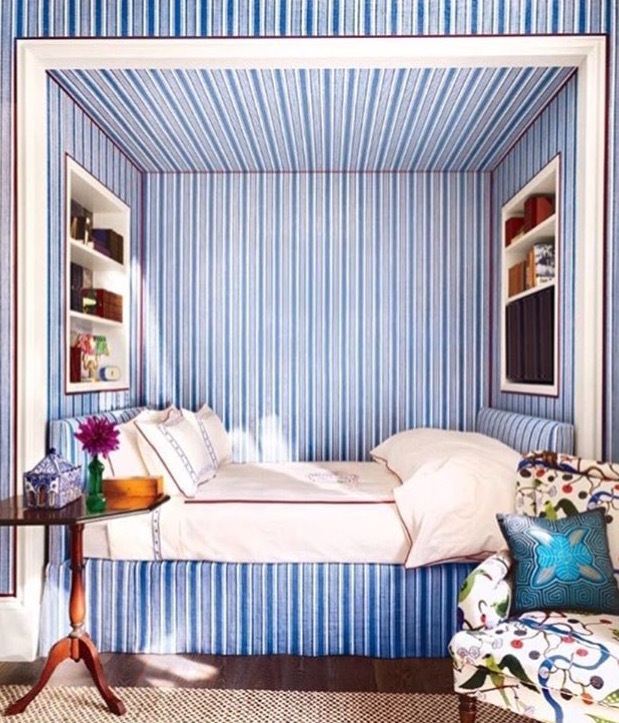 The vertical blue lines on the wall (and on the bed’s head- and foot-boards, along with the bedskirt) addÂ a fun, cheerful, and unique flair to this space. It’s undeniably eye-catching,Â and you’re immediately drawn in, wanting to see more. The great thing about stripes is that they can be used cleverly to help enhance the dimensions of a room. For instance, vertical stripes can make ceilings feel higher — and that’s certainly the case in Ridder’s design. Here, the nook doesn’t seem claustrophobic at all (a common problem in many nooks). Both the color palette and the pattern create a feeling of spaciousness without having to renovate. Additionally, stripes can complement a range of other patterns, giving you the freedom to come up with surprising contrasts. The easiest way to mix and match involves simply picking up the colors in the stripes. (For instance, you could easily add in classic blue-and-white ginger jars to a room with stripes in that colorway.) Or, you can follow Ridder’s lead by opting for a complete contrast, like the Josef Frank linen that covers the accent chair. What do you think about the blue stripes? Is it a trend you’ll try this spring?